Learn about the Brady BBP®33 Label Printer Kit for Slide Labels. Includes pricing, key features, and FAQs. 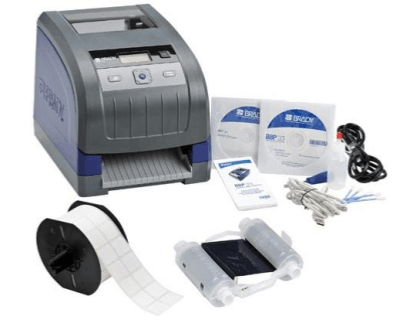 The Brady BBP 33 Label Printer Kit for Slide Labels is a high performance label printer that easily prints up to 3,000 slide or tissue cassette labels per day. Automatic label set-up with no calibration. Pros: Automatic label set-up, fast printing, built-in cutter, 5-year warranty. Cons: No QWERTY keypad, prints in one color only, not wireless. Bottomline: A simple to use label printing machine for printing slide labels quickly and easily. The Brady BBP 33 Label Printer Kit for Slide Labels retails for $1,375.00. This kit includes the Brady BBP 33 Printer which prints slide labels, tissue cassette labels and more with increased ease of use, no calibration steps and no wasted labels. No calibration or wasted labels - the BBP 33 Printer "reads" your cartridges and then automatically sets up the label correctly in your Brady software. 20-second material changeovers with foolproof "drop-in" ribbon and label cartridges. Impressive material lineup - with over 550 parts and 40 materials, this printer meets your primary labeling needs and so much more. Includes the Brady360® 5 year warranty that covers repair parts & labor, one print head replacement, a free loaner printer, a setup session, and more. Multi-application printer with complete range of supplies for Wire, Cable, Product and Electronics applications as well as Safety, Facility and Lean/5S. 8 hours / 5 days. 600 2” x 4” labels per day. 300 larger labels per day. (1) BBP 33 Label Printer with Auto Cutter. 1 roll of Stainerbondz slide label B33-141-481. Is the Brady BBP 33 Label Printer Kit a standalone label printer? No, the Brady BBP 33 Label Printer Kit is a peripheral printer, meaning that it needs to be connected to a power outlet. Where can I buy the Brady BBP 33 Label Printer Kit for Slide Labels? You can buy the Brady BBP 33 Label Printer Kit by clicking on the link above, or from sites like Megadepot and Amazon. What are some Brady BBP 33 Label Printer Kit for Slide Labels alternatives? Brady BMP 21-PLUS Portable Label Printer.